Want to meet eReaders and learn how to borrow eBooks, eAudiobooks, and digital magazines from the library? 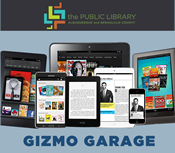 Visit our Gizmo Garage for hands-on experience with devices and in-person assistance with library downloads. For more information on what devices will be there and what you should bring, contact the library branch hosting the Gizmo Garage or visit the linked webpages. All of our branches have ongoing computer classes, many of these sessions also qualify as Gizmo Garages as our technology and devices evolve. Most classes require advance registration, please call your local branch to make an appointment to accommodate your schedule.